I've become such a shopaholic, especially when it comes to makeup. I recently did a little damage to my wallet at KollectionK.com, a Korean makeup (and KPOP memorabilia!) website that provides affordable options to customers from around the world. They also offer free gifts with every purchase. My co-worker and I placed an order here together and received a grand total of seven little free gifts (all from Etude House). They do not tell you ahead of time what freebies they toss in -- and we're guessing it's based on what you purchase (we purchased a lot of Etude, and got all Etude samples) and quantity of freebies is also price threshold based. If you're interested in KollectionK, I suggest signing up for their e-mail list as they constantly have flash sales (often brand-associated) so you can save a lot (or buy more!). TOP LEFT: Holika Holika Heart Ful Moisture Lipstick in RD808 Kissing Red. TOP RIGHT: Etude House Sweet Recipe Cupcake All Over Color in OR202 Peach Sugar Cake and PK001 Blueberry Cheese Cake; Etude House SHINI STAR Lip Balm in #2 Jonghyun; Innisfree Skinny Microcara in Black. BOTTOM RIGHT: Etude House Mint Cooling Eye's Cream; Etude House Golden Ratio Face Glam in #2 Pink; Etude House Black Charcoal Chin Pack Mask; Etude House Precious Mineral BB Cream Bright Fit in Light Beige N02. Click the cut for more on my thoughts of the products along with links on where to buy them yourself. Get ready to swoon. Review: This packaging could not be cuter if it tried, and a lipstick that itself is in the shape of a heart? ERRRRMAGAH. Better yet, this is actually very moisturizing and is pretty pigmented. The reviews I've read for other Holika Holika lippies have complained about it being very sheer -- I can definitely say this one was really flattering without being too much. I put it on in the morning and it lasted through till lunch without any smudging, and felt super moisturizing. A chain akin to Sephora in South Korea, with current models for their advertising including Sulli and Krystal of f(x) and all five members of SHINee. 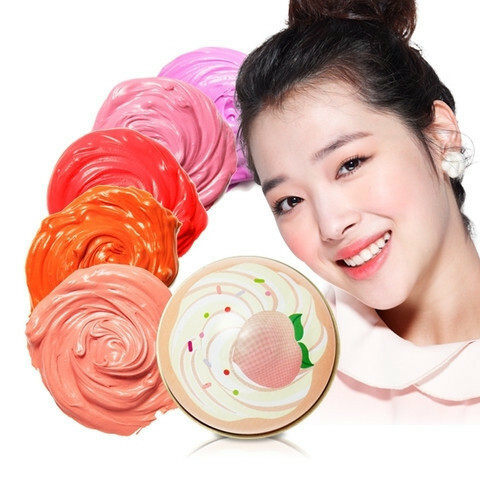 How cute is Sulli with her Sweet Recipe Cupcake All Over Color? Prime Engrish: N/A -- there are no real directions provided in the labeling. Review: I use both of these as cheek color (the Peach is a pretty coral; the Blueberry is more of a pastel/hot pink), and they can also be used as subtle eye color. I bought two different colors, but they both have a distinct peachy/creamsicle smell (yes, the "blueberry" one smells like peaches). Simply pop 'em open and dot some color onto your cheeks and smooth in. Really easy to use. Final Verdict: Use 'em on your cheeks - a little goes a long way. I do not recommend it for your lips however -- even though it's advertised as an "all over color". The formula is not very flattering as a lip color. Prime Engrish: I'm not quite sure why this is labeled as "SHINI STAR" lip balm when it's clearly a nod to the boys in SHINee. Shouldn't it be "SHINee STAR"? As Advertised By: All five members of SHINee. I purchased Jonghyun's "color". 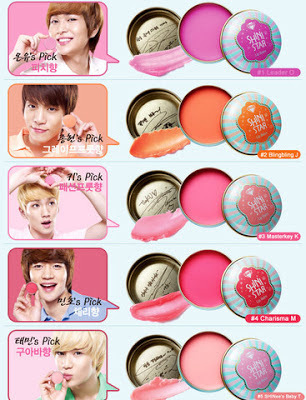 In the promotional images, the boys signatures were featured in the caps of the lip balm -- but mine definitely does not have Jong's signature printed in, nor any photo him or of SHINee at all. Sadface. The other boys colors are Purple-Pink (Onew), Bubblegum Hot Pink (Key), Hot Pink (Minho) and Light Pink (Taemin). Review: The consistency is totally different than the Sweet Recipe Colors and the package itself is slightly smaller. I originally felt like Jong's orange-y/coral color was the least flattering of the five shades for my skintone, but I was hellbent on getting something SHINee and I'm so glad I did. Despite being bright, the color is actually quite sheer and very flattering. The feel is very moisturizing and it immediately melts when you apply it to your lips, similar to a tinted version of the Rosebud Lip Balms. Final Verdict: Of all the things I bought, I honestly use this the most after my BB Cream. I loveeeee it. Prime Engrish: I would giggle about "Eye's Cream" but I must say in its defense, it's a pun for "Ice Cream", because the product is "shaped" like an ice cream cone. Review: You unsnap the cap, twist the product up a little and apply it around your eyes to help relieve dark circles. It actually has SPF 30 in it, so it can be used under makeup during the day -- but I've only used it at night. The term "min cooling" suggest it would have a minty smell, but it doesn't -- it has a very faint perfume-y fragrance that is imperceptible when you put it on -- and the product is light blue in the tube but goes on totally clear. Final Verdict: When it's applied, it does have an immediate cooling feeling that lasts for a few minutes, which is a great relaxation/pick me up especially now in the hotter months. I really love this. I can't really say if it's doing much for dark circles, however -- but it does feel nice. Just don't over swipe -- just a few passes is enough. Otherwise it leaves behind a weird, white crust. Prime Engrish: "This 2 in 1 highlighting base and brightening eye makeup accentuates facial features to beautify according to ideal proportions." Review: It's also available in a gold version but I went with pink since my face has more pink/blue undertones to it. Twist off the cap for a liquid highlighter base that you an apply as a luminizer on your cheekbones/decolletage, etc. Flip up the top cap to reveal a small solid base that you can apply to eye lids as an eye brightener or primer before eye shadow. It also has a mirror in the cap so you can toss it in your purse and use it on the go from day to night. Final Verdict: I'm finding I'm using the eye base more than the actual liquid luminizer, but both are great. I use the eye base as a makeshift eyeshadow in the morning -- it quickly brightens up my eye with minimal effort. Prime Engrish: Where do I begin? The packaging features an "Eagle Owl" who "talks" to you on the back of the package. "Hi~~ I am Eagle Owl! ... The great night bird! I am in danger of extinction, because hunting has become so difficult in bright city nights. Please help me to fly freely again!" ... I'm not sure how this relates to a chin face mask, but...sure. We'll roll with it. Review: Honestly, I haven't tried it yet because I don't want to get rid of the packaging. When I do, I'll let you know on my Twitter. Prime Engrish: "Brightening O K! Darkening Z e r o!" Alright! Review: Words can't express how happy I am with this. It's so lightweight but still offers great coverage, so it's perfect for the summer months over liquid foundation. Comparison to The Face Shop's BB Cream: This has no weird, unplaceable "after" smell unlike my The Face Shop BB -- instead it has a softer, much more pleasant scent that disappears as soon as it's applied. The overall texture is much creamier/softer so if you have drier skin, this is a major plus. The Face Shop's boast SPF 37 but this has SPF 30 so it's pretty much just as safe to use in the sun. Final Verdict: This is honestly the best BB cream I've used so far (in comparison to The Face Shop, Smashbox and Garnier). It does have a pretty dewy finish, so if you want something more matte, you may need to apply a powder to mattify it. But for me -- I loveeeeee it. Unsurprisingly, it was my fave of the entire purchase. 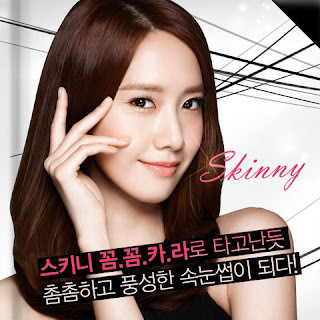 Current models include Yoona of Girls' Generation. Girls' Generation's YoonA with her Microcara-ed look. Prime Engrish: "Microcara"? What is that, exactly? As Advertised by: Yoona of Girls' Generation. Review: Let it be known I am not a mascara girl -- mostly because despite my curly hair, my eyelashes never hold curl and whenever I apply mascara, it never seems to make a visible difference. This brush is interesting because it is so small and thin, so it really is able to easily coat all of your lashes from root to tip so they look thicker and darker. Final Verdict: I ordered this for fun in the hopes that I'd look like the face of SNSD (haha) and as a non-mascara person, I was pretty pleased. Review: The smells of these are so on point. The banana really smells like sweet bananas. The strawberry really smells like sweet strawberries. (A third sample Body Wash was included in our package as well that was Chocolate that smelled like Chocolate Cake. Heavenly!) It emulsifies really well in the shower but the scent isn't so overpowering that you walk around smelling like bananas all day (which I'm cool with). I wish they had these scents in hair products. How amazing would that be? Review: This moisturizer is really nice and has a fab cooling after-feel which makes it an awesome choice for summer/hot months. Review: This basically works as a serum to be used under face masks or for daily use over a moisturizer, etc. etc. I already have a serum I really like, but this sample is fun to play with. I don't think I'd pay for the full size, but that's just me. Okay i loveloveloooooooooove ANYTHING with KPOP or Korean beauty! Def going to make some purchases on the website you suggested. I'm pretty sure you've tried sheet masks as they are WILDLY popular with the asian beauty community. I hear the ones fro Etude House and Beauty Clinic are BOMB as they come in a wide variety of treatments. Great post! Have you visited The Face Shop in NYC? They have lots of face masks there to try! I'm super beyond impressed with Etude House brand on the whole -- everything I've tried by them as been awesome!